A c1890 canoe centerpiece, L = 12.5″ (31.8 cm), cut in the Quarter Diamond pattern and a c1903 pitcher, H = 9″ (22.8 cm), cut in the Hindoo pattern. Both by J. Hoare & Company. As seen at the Corning Museum of Glass, 21 May 1998. Only two design patents were issued by the USPTO to individuals associated with J. Hoare and Company. Surprisingly, the Croesus pattern was not one of them. One of the company’s most expensive patterns, Croesus was cut mainly during the early 1890s. 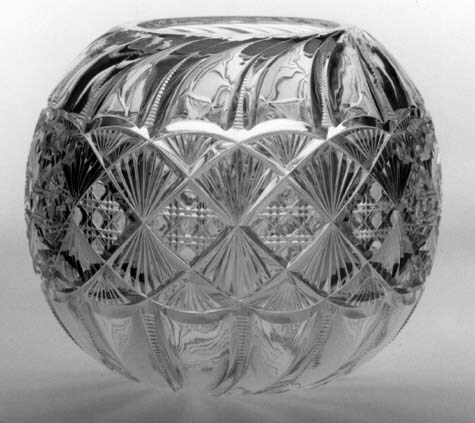 The pattern clearly shows the influence on American manufacturers of earlier British and Irish cut-glass designs. D = 9.25″ (23.5 cm), H= 7.75″ (19.7 cm), wt = 5.5 lb (2.5 kg). Sold for $600 in 1989 (1/2″ x 1/4″ interior chip under rim). The biographical sketch of John Hoare was written in 1896. A couple obvious errors have been corrected and a couple queries raised. The reader should note that Spillman has found that “accounts of Hoare’s various partnerships are contradictory”. Nevertheless, this sketch is important because it emphasizes John Hoare’s ability as a “designer and practical cutter”, as well as a teacher. He was also a successful businessman. While there is no discussion in the sketch of the cut-glass business that Hoare started in England in 1848, Revi mentions that for five years it “had some degree of success”. Spillman, on the other hand, states that it “was not particularly successful”. Both authors, incidentally, repeat the story in the biography that the Hoare family arrived in this country with only “half a sovereign”, a typical poor-immigrant tale which probably should be taken with a grain of Irish salt. The first thought to have the portrait of Mr. John Hoare adorn one page of our photograph book [i.e. the 1896 catalog], with a short sketch of his life, came when the matter of a book of new designs was first talked of some few weeks ago. But as Mr. Hoare suddenly died in New York City, June 17th, 1896, while on business for the firm, we are now using his picture as a memorial and writing the sketch of his life as a biography.John Hoare, more familiarly known as Captain Hoare, was a native of Ireland, born in the city of Cork, April 12th, 1822, and was the oldest but one of the large family of children of James and Mary (Courtney) Hoare. He learned the glass trade with his father in Belfast, and afterwards at the age of 20, left Ireland for England, where, in Birmingham, he worked as journeyman for Rice Harris at Five Ways [Islington Glass Works? ], also Thomas Webb at Wordsley, afterwards acting as foreman and traveling salesman for the firm of Edward Lacey & Son, of Birmingham. He was also foreman for Lloyd & Summerfield, (The Park Glass Company), one of the oldest glass houses in England. In 1848 Mr. Hoare began business for himself, and in 1853 came to New York with his family, the extent of his finances on landing at Philadelphia being just half a sovereign. But being a skilled and experienced glass cutter he had no difficulty in finding a good situation. In New York he began work for E. V. Haugh[wout] & Co. on Broadway, and after one year, with five partners formed a glass cutting partnership, he being the active man of the concern. After two years Mr. Hoare bought the interests of two members of the firm and then organized under the name of Hoare & Burns. This partnership continued until 1855 [1857? ], when Mr. Hoare purchased and became proprietor of the glass cutting department of the Brooklyn Flint Glass Company, State [S]treet, Brooklyn. In the same year the old and well-known firm of Gould & Hoare was formed, and continued until 1861, then being succeeded by Hoare & Dailey who were in business until 1868, when the senior member of the firm [Hoare] established a cutting shop in Corning, still retaining for several years his business interests in New York City, at the corner of White and Elm streets, and also at [Dorflinger’s Glass Works], Greenpoint, Long Island. The business of Mr. John Hoare as a designer and practical cutter, has led the manufacturers of the United States, and to-day some of the best manufacturers in the business are men who learned the art of designing and glass cutting under his personal instructions. Some ten years ago Mr. Hoare partially retired from business by selling his business to Messrs. James Hoare, his son, and Geo. L. Abbott, equal interest, so that the business in the future will be conducted in the same manner as in the past, although the pleasant face and cheerful words of Mr. John Hoare will be sadly missed by his associates and the small army of employees, as well as many customers who knew and loved him well. Half a dozen years after John Hoare’s death, the company began to experience financial difficulties that persisted during the firm’s final years in business. According to Spillman this trouble apparently initially resulted from “careless business practices, and a certain amount of rivalry between the partners” (Spillman 1996, p. 37). In spite of these financial difficulties, however, J. Hoare and Company ran a branch factory in Wellsboro, PA from 1906 until 1914. In 1908 the company was incorporated. Subsequently, over-all production became increasingly limited, especially after 1914, and the company ceased operations in 1920. John Hoare’s experience in England undoubtedly provided the basis for some of the cut-glass designs he produced in this country. A design thought today to be characteristic of the American brilliant cut glass period — Hoare’s Wheat pattern — can be seen as a close relative of mid-nineteenth century cut-glass designs produced in the English Midlands. 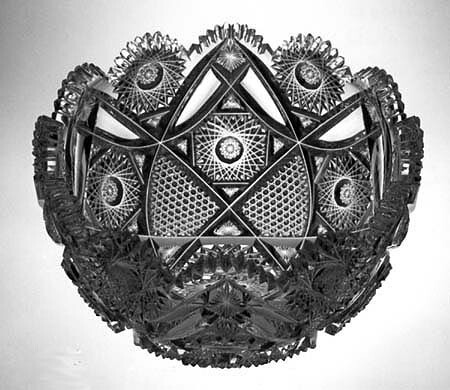 Even Hoare’s famous Crystal City pattern (patented in 1891) appears to have been derived from a specific English design. Although cut glass of fine quality was produced by Hoare during the company’s last two decades — as shown by examples at the Corning Museum of Glass — the average “bread-and-butter” cut glass from much of this period was often inferior, judging from what is frequently found today. 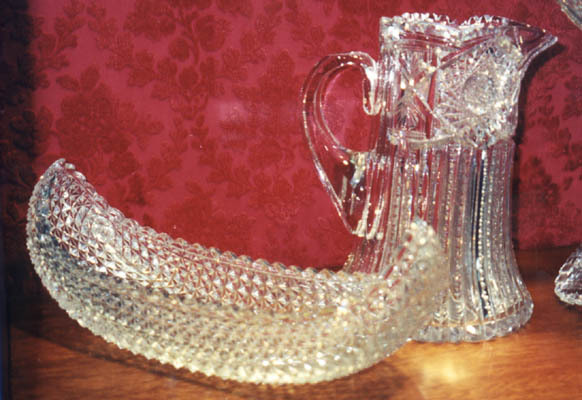 The company had begun to use “figured” blanks by at least 1911, and final polishing was often neglected or carelessly done, resulting in glass that has an “acidy” appearance. Consequently — and somewhat perversely from the collector’s point-of-view — Hoare cut glass that has been acid-etched with the company’s trademark (beginning in 1901 or 1902) is not necessarily cut glass of fine quality. The collector seeking top-quality Hoare cut glass is well-advised to seek out unsigned specimens made during the nineteenth century. Recently, evidence has surfaced that Hoare may have introduced a paper label by 1889. An illustration of a Hoare vase with a circular paper label showing the Hoare trademark is found in the Hoare archival material and dates from around 1900. It is not clear from this statement whether the paper label referred to dates from “by 1889” or “from around 1900”. Or, are there two different paper labels? There are neither illustrations nor detailed descriptions. It is also stated by Sinclaire and Spillman (on p. 52) that the Hoare trademark — the one illustrated below, on the left — was acid-etched on glass as early as 1895, the date mentioned in the trademark’s registration papers (but where, apparently, there is no reference to acid-etching). Spillman (1996, p. 40) backs away from this contention, however, by writing “Whether or not the trademark was adopted before 1900, it was not acid-stamped on the glass until 1901 or 1902, although it might have been on a paper label [earlier]” (emphasis added). 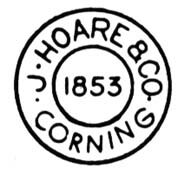 In spite of this confusion, the received opinion regarding the Hoare trademark is that it was in existence as early as 1895, when it was probably used on paper labels, and that it was not acid-etched on glassware until 1901 or 1902. It is this last point that is of particular interest to collectors. Paper labels from 100+ years ago are not likely to be found today, and when they are found one must be aware that they may be fakes. Facsimilies of original paper labels are easily produced using modern technology. The other two trademarks shown above, center and right, are somewhat problematical: Were they ever used? Spillman always writes of “trademark” in the singular. The mark on the right apparently is a generalized form where the blank area could be filled in with the location of the manufacturer, usually Corning, although Swan (1986, p. 244) also suggests New York as a possibility. This writer has seen the 1853/Corning trademark frequently but never a case where New York — or any other place, such as Wellsboro — has been substituted for Corning. Revi (1965, p. 468) provides this “incomplete” trademark, as well as the trademark in the center, but he offers no explanation for either mark. The writer would appreciate hearing from readers who have seen these alternate trademarks. Finally, J. Hoare & Company — like Hawkes and Sinclaire — occasionally used the name HOARE in block-letters, acid-stamped on stemware. Sinclaire and Spillman (1997, p. 51) suggest that this style could have been in use as early as 1900. Additional catalog pages — as well as two scrapbooks kept by the company — are available at the Rakow Research Library, Corning Museum of Glass. 1882-1915: J. HOARE AND CO., CUT GLASS, CORNING, N.Y. A collection of illustrations from various incomplete catalogs. Section1. Illustrations from the period 1882-1890. No pattern names or original prices given, pp. 1-12. Section 2. Illustrations from the period 1906 to 1910, with pattern names and shape numbers. No original prices given, pp. 13-68. Section 3. A selection from the two J. Hoare & Company scapbooks. Some pattern names and shape numbers. No original prices given, pp. 69-120. Section 4. Silver mounted items produced by the Gorham Manufacturing Company using Hoare cut glass. No original prices given, pp. 121-144. Published by the American Cut Glass Association in co-operation with the Corning Museum of Glass. , 144 pp. c1890: A “PRICE LIST” in the Rakow Library, CMG. Includes a pictorial array of 28 named patterns as well as additional illustrated patterns (not all named), in Sinclaire and Spillman 1997, pp. 33-38. The array is also reproduced, enlarged, as the frontispiece in the foregoing publication. c1891-c1893: Individual pages containing illustrations and pattern names, some of which are shown in Sinclaire and Spillman 1997, pp. 38-40. Spillman 1996, p. 41 lists the pattern names. No original prices. 1896 and 1911: J. HOARE AND CO., CORNING, N.Y., RICH-CUT GLASS WARE. Contains two complete catalogs. Published by the American Cut Glass Association in co-operation with the Rakow Library of the Corning Museum of Glass. 1997, xvii + pp. 1-162. 1896 catalog, pp. 1-109; 1911 catalog, pp. 110-162. With original prices. Hellwig, Franz, 2004: The king of Crystal City, Part 1, The Hobstar, Vol. 27, No. 1, pp. 8-9; Part 2, Vol. 27, No. 3, pp. 12-13; and Part 3, Vol. 27, No. 4, pp. 5-6 (4411-2). Precise cutting is evident on this deep bowl that uses both miter- and pillar-cutting techniques. The pattern, Manitou, and the shape, no. 8702, can be found in the company’s 1896 catalog where the bowl has a listed price of $30. Although the Hoare company exhibited at the World’s Columbian Exposition, no account of the patterns displayed there has come to light. Manitou may well have been in production in that year, 1893. The word itself is Algonquin in origin and refers to the Great Spirit of the Native American tribes that occupied vast areas of North America which were also inhabited by multitudes of bison (buffalo). The “clear areas” on the bowl are actually pillar-cut horns (“tusks”) and are undoubtedly a reference to these mammals. (A bison and a Native American share the fair’s official plaque with the mythical Columbia. The bison’s horns are also suggested in William C. Anderson’s patented Columbia pattern, one of several patterns cut by the Libbey Glass Company in its pavilion at the fair.) D = 9.0″ (22.9 cm), H = 5.0″ (12.7 cm), wt = 5.5 lb (2.5 kg). Condition statement reads “rim chips and small piece of rim glued; not repairable”. Sold for $150 in 1987. The following compilation is largely based on the J. Stanley Brothers, Jr. volumes of patent material at the Rakow Library of the Corning Museum of Glass and the U. S. Patent and Trademark Office’s Web site where the reader can find complete patent applications, including specifications and (usually) drawings, the latter of best-available quality. Revi’s early work (1965, pp. 167-171) has also been helpful. No patents were assigned to the Hoare company; all were retained by their patentees (*).